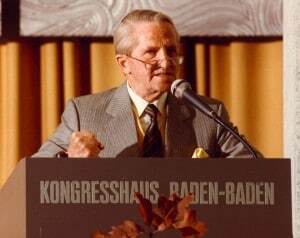 The REGENA-Therapy was developed by Günter Carl Stahlkopf in 1963 and has established an excellent reputation within complementary medicine due to its holistic method of treatment. The therapy works with an assortment of specially composed homeopathic complex remedies, named REGENAPLEX®. They are used in combinations according to the needs of each individual person. The REGENA-Therapy is based on the insight of all pathological dysfunctions deriving from “pollution” and intoxication of the organism respectively. The causes of such dysfunctions are manifold: Inherited factors, a deluge of artificial substances, environmental pollutants and unhealthy lifestyle with too much stress, an unbalanced nutrition, side-effects of pharmaceuticals to name just a few of these. The impact of this “pollution” on our body is thoroughly described by Prof. Dr. med. Alfred Pischinger in his book “System der Grundregulation (system of basic regulation) (1975, Karl F. Haug Verlag, Heidelberg). The famous physician and scientist defined the ”Pischinger Raum“ as a functional unit of blood vessel endings, cells of the connective tissue, and the endings of the lymph channels and neurons, connected by the extra cellular space and its fluid, that is taken up by the lymph channels and lymph organs. This area of action and information is responsible for nutrition of the organs and the regeneration of their functions. Here, the Cell-Milieu-System is regulated and at the same time defence and inflammation processes take place. Essential for life’s basic functions, the “Pischinger Raum” serves as the basic defence- and control system (system of basic regulation). The state of the “Pischinger Raum” is decisive for the health condition of the entire organism. Accumulating depositions of waste in this area leads to dysfunction and damage of cells and organs. Cells are supplied with oxygen and nutrition from here and deposit their “waste” here, too. An accumulation of waste in this “Pischinger Raum” impairs the exchange of substances dramatically. Through our perception of harmony or disharmony, we experience health or sickness. Since every act of nature has a purpose, aspiring to order and harmony, we can view every sickness as the pursuit of order and harmony, of ‘wholeness’. The REGENA-Therapy supports this perception with homeopathic complex remedies. The formulations consist of single agents of classical homeopathy, carefully combined and based on a further development of the principles of Hahnemann and the law of similars (similia similibus curentur). Causes of existing illnesses are often varied and sometimes have their origin way back in our lives. Through a comprehensive anamnesis, a REGENA-practitioner will try to encompass the totality of symptoms in order to find out the true causes of the illness. From this outcome he starts with the therapy. A thorough anamnesis is essential for a successful application of the REGENA-Therapy. This comprises not only of the detailed description of the development of the illness, especially the chronicle illness and the laboratory-analyzed findings, but also of the history of illnesses throughout life, illnesses in the family and the circumstances in the life of the patient.